I've read an article about a new sweet from Lawson last month and I was looking forward to trying this. It's called "Atsuyaki Pancake" which means thick pancake and it's available from today, September 3, 2013. 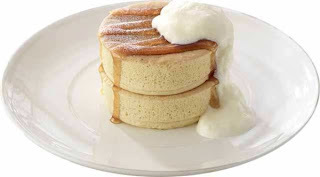 The official image reminded me of Hoshino Coffee Souffle Pancake a lot. The reason Lawson created this pancake, and also Eggs Benedict, is that pancake has been a huge boom recent years since Sarabeth and other famous breakfast or brunch restaurants came to Japan. This pancake contains meringue to make it soft and also chewy texture, that we say "Mocchiri" in Japanese and the texture is different from chewing gum or caramels. It's like when you're eating sticky rice cake or marshmallow could have close texture. The package is transparent so you can see the content. And you can see there's a plastic bag stuck on the side. It's a bag of whipped cream to add to the microwaved pancakes. There're several warning for the whipped cream bag; when you microwave the pancake, you need to take the little whipped cream bag off and also you can't squeeze the bag too hard otherwise it explodes. If you're using 1500W microwave, it only takes 15 seconds but if it's 500W, you need to reheat it for 45 seconds. The name is "Atsuyaki" so I was hoping it'd be thick and tall as the visual I saw. And it was about 5cm total. I thought this pancake might taste good as it's cold. *This product is available at cold dessert racks. I removed the pancake with the paper underneath to a plate and reheated for 40 seconds. It started smelling sweet while heated. I tore off a part of the whipped cream bag and squeezed the cream over the warm pancakes. And as you can see, the hole was small so that skinny strips came out quickly. There's a little V-shaped cut on the bag where you tea off the end, but if you'd like to avoid the weird spaghetti looking cream over the pancake, you might wanna tear it larger or use scissors to make a big hole. Maple syrup flavor is all over in the kitchen! This is the inside of the pancake. I saw a lot of air bubbles in the cake. It was actually soft and "Mocchiri." Not too heavy or too light and had a great maple syrup flavor. I started wondering if only the upper pancake has maple syrup, but when I saw the bottom one, there's also enough maple syrup so I could enjoy the flavor and taste till the end. About the whipped cream, it was ok, nothing special so that I thought this pancake would taste just fine without the cream. It's 350 JPY and the pancake was so different from the ones I've tried sold at room temperature as they tend to mushy and thin pancakes. This was something new available at conbini and it tastes as good as the ones you can get at some of the cafes.